IT's BAAACK! 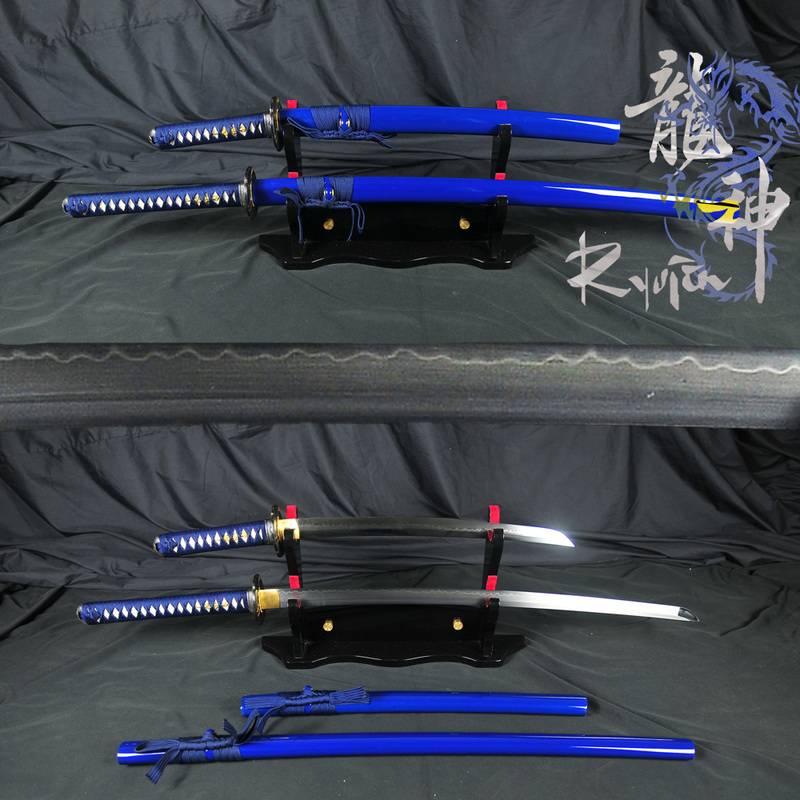 Katana, Wakizashi and Sword stand special offer - select your custom color combination and theme. Special Promotional Offer, huge discount - offer ends February 12th, 2019. BACK BY POPULAR DEMAND: Special Promotional Offer - HUGE discount on a traditional Swords of the Samurai Blade set with Katana, Wakizashi and Double Sword Stand. The Daisho (literally meaning 'big and small') was for many hundreds of years the badge of honor that separated and elevated the Samurai warriors from the ordinary folk of feudal Japan. On pain of death only the Samurai class were permitted to carry this distinctive set of swords - the 'longsword' (Katana) and the companion sword (Wakizashi) - and these two blades were never far from the Samurai's side. In this special offer from Ryujin, you can create your own custom Samuari Daisho set - assembled and shipped out to you within a week (often much faster). To get started, simply select the color scheme and theme you would like and we will take care of the rest..! This offer is only available until midnight EST the 12th of February 2019 and while stocks last. 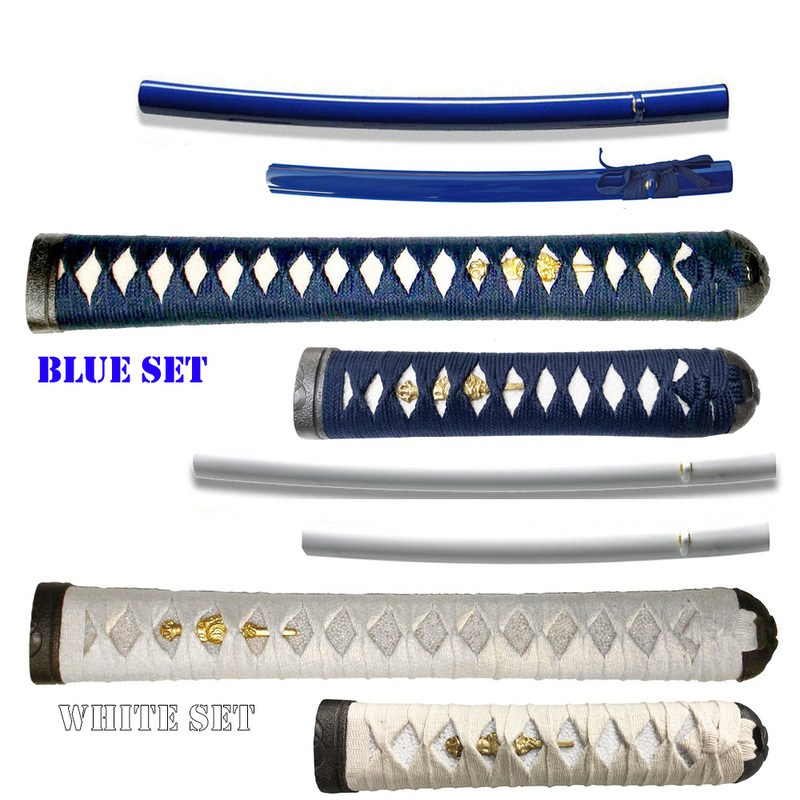 This is one of the most exciting developments in the sword industry for YEARS - the option to customize your own high quality, solid performing out of the box T10 tool steel differentially hardened Samurai swords with real hamon WITHOUT waiting for weeks, months or even years - at an incredibly low price and assembled and shipped from WITHIN the United States..
1) Select if you would like both swords to have a bo-hi or solid bodied blade. A bo-hi looks more attractive and lightens the sword slightly. Solid bodied blades are a little stronger and deliver more forceful cuts. 2) Select the core tsuba design - both Wakizashi and Katana will be outfitted with this same theme. Fittings are made from solid iron, most are also inlaid with real gold leaf. 2) Select the overall color scheme. 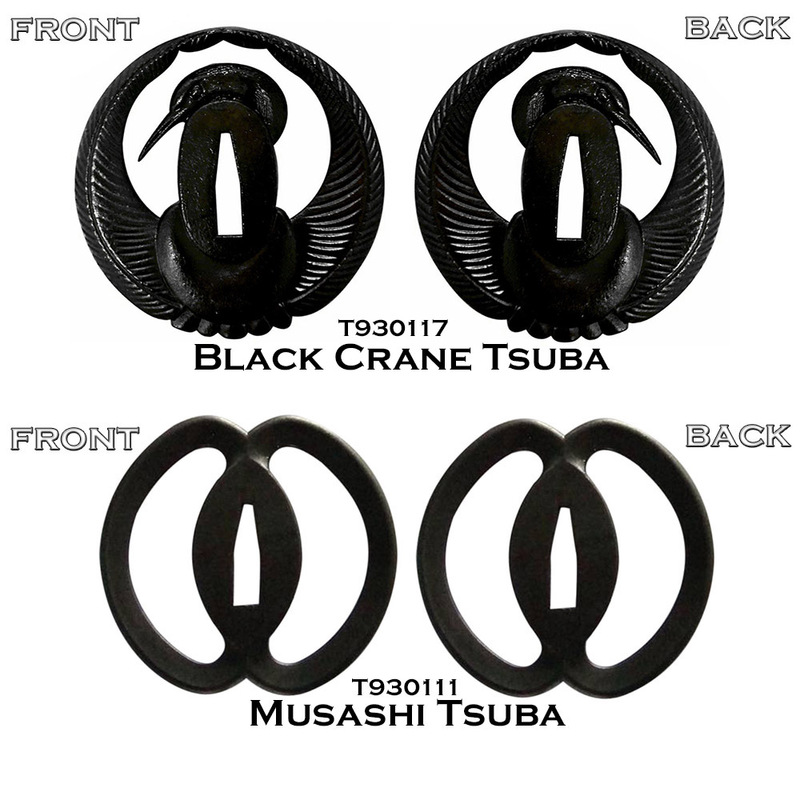 Black is the most traditional and was the prescribed 'Banzashi' Edo style. 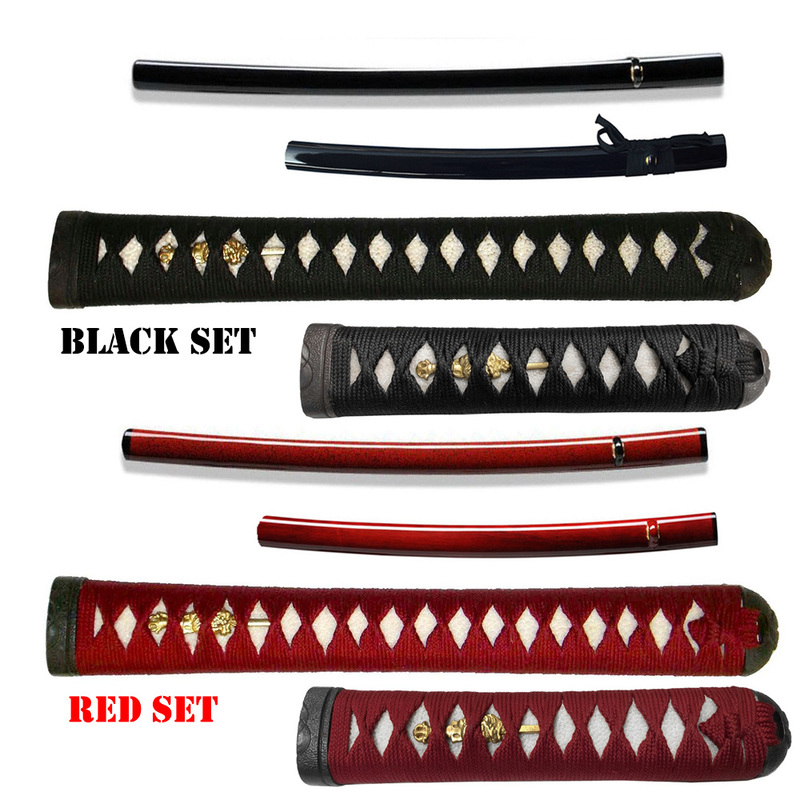 Red sets were usually for maverick Samurai, Ronin and Kabukimono (the crazy ones). 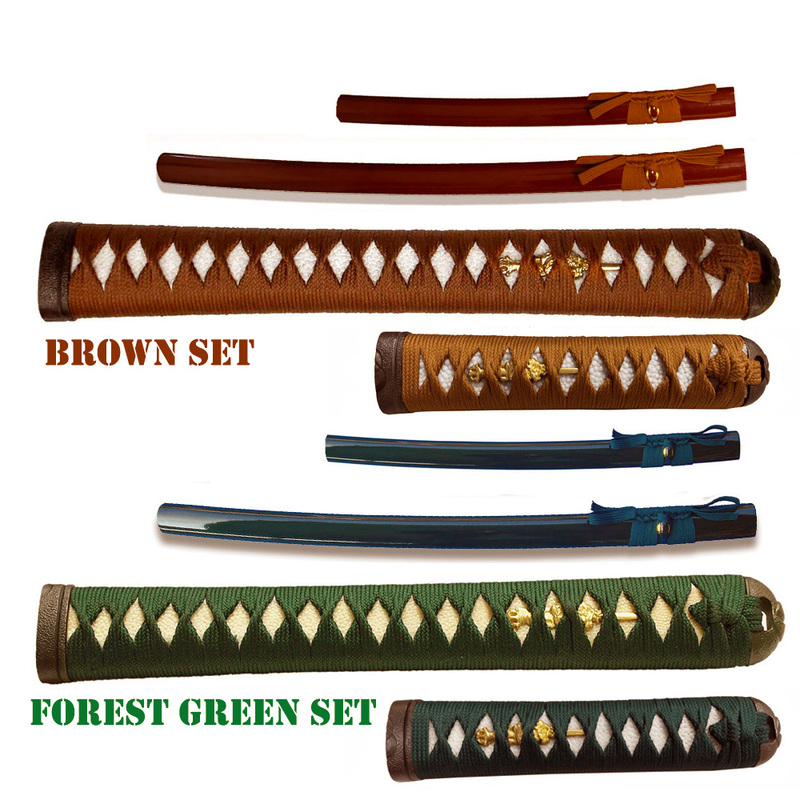 Blue, green and brown tended to be used by high ranking officials, Samurai in the provinces, nobles and the Daimyo Samurai Lords. (in Japanese, green is a shade of blue, so both are considered to be 'blue'). White is rare and is the color of death and tends to suggest a suicide mission. All fittings will be decked out in the same color and theme to create a perfectly matched set. Suitable for frequent backyard or dojo cutting. Also great to display as functional sword art. Differentially hardened fully sharpened T10 Tool Steel blade with real hamon and bo-hi (fuller). Solid iron fittings. Rayon wrapped ito in your selected color over authentic rayskin. Wooden lacquered saya in color and style to match the handle fittings.